A tropical oasis nestled on the scenic south coast of Mauritius, Villa Dadou is well-suited to larger group holidays in Mauritius. Overlooking the glistening turquoise lagoon, this villa places you close to numerous nightclubs, pubs and restaurants where you can sample local and international delicacies. Tan to your heart’s content and inhale the salty sea breeze in the morning as you step out on the soft dewy grass. With spectacular views, Villa Dadou boasts plenty of space so you feel relaxed and at home in a picturesque atmosphere where you can relax at the end of a fun-filled day. 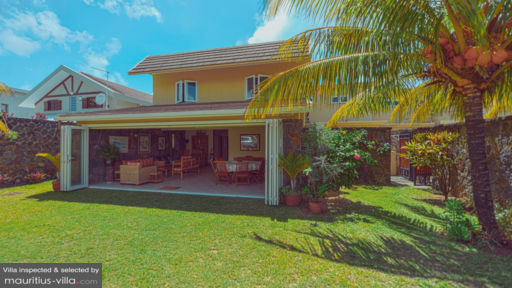 Villa Dadou is well-suited for groups of ten people. With a stay at this villa, you can choose between five bedrooms. Four of the bedrooms have attached en-suite bathrooms where you can relax and rejuvenate while enjoying plenty of privacy. Three of the bedrooms are equipped with Queen-sized beds, while the last two guest rooms boast a total of four single rooms. All the rooms are enhanced by premium bedding and all the required amenities that you will need to have a good night’s rest. To help you enjoy the tropical weather to the fullest, Villa Dadou offers an outdoor sitting area where you can sip on a freshly brewed cup of coffee as you gaze out at the azure horizon. Alternatively, tuck into an Al Fresco meal with your friends and family on the outdoor seating area. When you want to take in the sun, step out on the lush green grounds and lie down on one of the lounge chairs facing the ocean. When you want some shade, rest assured that the outdoor areas of Villa Dadou does come with plenty of thick foliage to provide some respite from the warm tropical sun. Enjoy plenty of space to relax and replenish when you book Villa Dadou. There's a well-furnished dining area overlooking the patio. With large glass doors to let in plenty of sun, this space directly opens onto the living area. With a set of comfortable sofas, television, coffee and side tables, this particular room is all set to accommodate the whole family for a cozy afternoon or evening spent indoors. The open-floor layout of the villa leads directly into an independent kitchen with an island bar and stools upon which you can perch as you sip on a beverage of choice. Because this villa is self-catering, you will find an assortment of accessories and utensils, including microwave, kettle and a gas stove, among others, which you can use to prepare your meals. Upon request and at an extra cost, additional services such as car rental and airport transfer can be hired. Included in your villa package are complimentary laundry facilities and housekeeping, whereby an experienced and friendly housekeeper will show up to take care of the cleaning and general indoor maintenance of the villa. 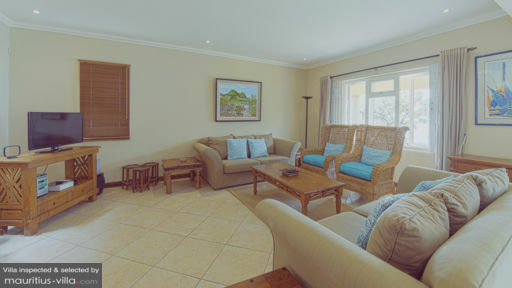 Therefore, grab your favorite drink, put your feet up and relax as you enjoy the very best that Mauritius has to offer! Villa Dadou places you 10 kilometers from Blue Bay public beach, one of the best swimming and snorkeling spots on the island. 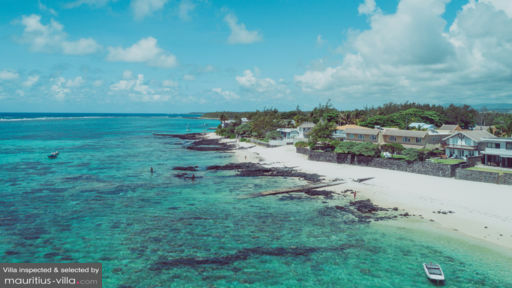 True to its name, Blue Bay is also known for its calm and crystal-clear waters, perfect for when you want to indulge in activities such as glass-bottom boat rides. Nearby, the historic village of Mahebourg offers plenty in terms of shopping, culture and cuisine. Don’t miss a tour to the Mahrbough Museum which will give you an excellent glimpse in how the island used to be back in the French colonial days.